LIVE REPORT: SCANDAL @ THE COLISEUM, HARD ROCK HOTEL [Singapore] | VKH Press – J-Rock & Visual Kei Coverage Worldwide! It had been two years since SCANDAL last performed in Singapore—the wait was finally over! Fans would at last be treated to an experience they would never forget, a night of splendor from one of Japan’s top girl bands! On May 8th, SCANDAL performed at The Coliseum at the Hard Rock Hotel in Singapore as part of their world tour, HELLO WORLD. VKH Press was honored to be able to cover the event during their stay! If you haven’t heard of them yet or listened to their latest album, HELLO WORLD, here’s the tracklist below for your reference. *The limited edition version includes a DVD of SCANDAL talking about HELLO WORLD. I arrived at the Hard Rock Hotel at 17:10 to see tons of fans lining up waiting to enter the venue. Doors were supposed to open at 19:00 but everyone was already ready to rumble with SCANDAL! When I first reached the hotel, I had thought that their fans had only been waiting since 14.00 since that’s when we were allowed to start lining up, but after speaking to fellow media reps covering the event, it seemed that some fans had camped overnight just to get into this concert! As insane as it may sound, this is the level of dedication that their fans have for them. In any case, I went ahead and picked up my media pass. At 18:55, knowing that the doors would be opening in five minutes, most of the fans began standing up and getting ready to go in! Shortly thereafter, VIP ticket holders and media were allowed to enter the Coliseum. What I found amazing while waiting for the event to start was that whenever they made an announcement welcoming us to SCANDAL’s concert, fans would scream out for them without fail. It really made me envy the amount of dedication they have towards SCANDAL! 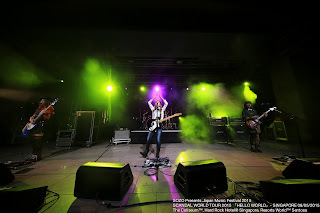 SCANDAL entered the stage around 20:10, and the crowd immediately went wild howling out the members’ names. Then it all started, with part of Duke Ellington’s “Take the ‘A’ Train,” which they followed up with the four of them standing side by side and giving an extremely warm welcome to the audience! They then picked up their instruments, while RINA went to her drums—all of them getting into position to get the show rolling. Ten minutes later, they played their first song “love in action,” which really served to hype up the crowd! The audience could finally start unleashing all that energy they’d been saving up for the event. We could see people jumping and also light sticks waving around in time to the music. HARUNA ended the song with a huge thank you and without delay, they proceeded to their next song, “Satisfaction.” This is one of the parts of the concert that I loved most because there was audience interaction. HARUNA invited the audience to clap along with her to the beat of the song and everyone was really feeling it! 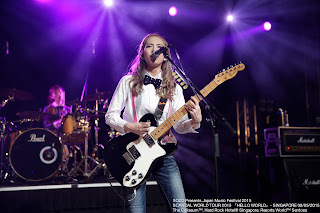 The crowd also sang along during the parts where she sings, “Woah oh, woah oh,” which goes to show just how much SCANDAL’s songs are loved no matter where you are on the planet. Around 20:28 they played two consecutive songs with no signs of stopping just yet! 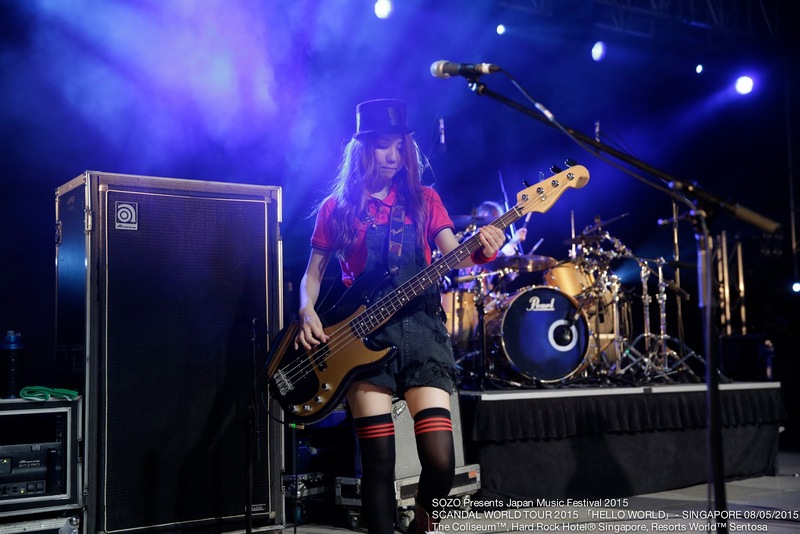 HARUNA turned to the crowd and asked, “Singapore, are you ready? !” The audience of course screamed with joy in response but it just wasn’t powerful enough! HARUNA asked them again and this time the screams were really ear-piercing! Moving on, they played “DOLL”! The audience started jumping and clapping again and now you could see SCANDAL towels being swung in the air, too. It was really touching to see such active participation—simply the ideal kind of concert to attend. The spotlights turned purple, signalling a quick interval was taking place. 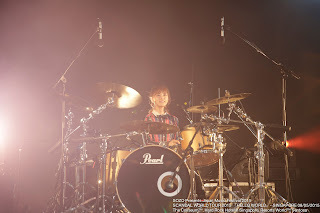 After the regular spotlights returned, HARUNA was back on stage, emceeing excitedly, “Singapore! Hey, what’s up? !” and “Is everyone having fun? !” The crowd yelled back in joy to all the members. “Syunkan Sentimental” then started playing and everyone went back into it! Personally, this song really did feel sentimental, as I had liked this song a lot a few years back when it was first released. The fifth song, “SCANDAL BABY” was another highlight of the concert as we could see SCANDAL enjoying themselves and dancing along to the song, too! At the end of this one, we were treated with a heartfelt thanks from HARUNA. Next up, we had “Kagen no tsuki”! By now, the set-list had already amazed me as it was quite impressively arranged in such a way that the crowd wouldn’t die down in terms of excitement. Whenever they got to the song’s chorus, I would be reminded of how RINA left her drums and just walked beautifully in the MV. I can’t help wondering if anyone else was picturing that, too? 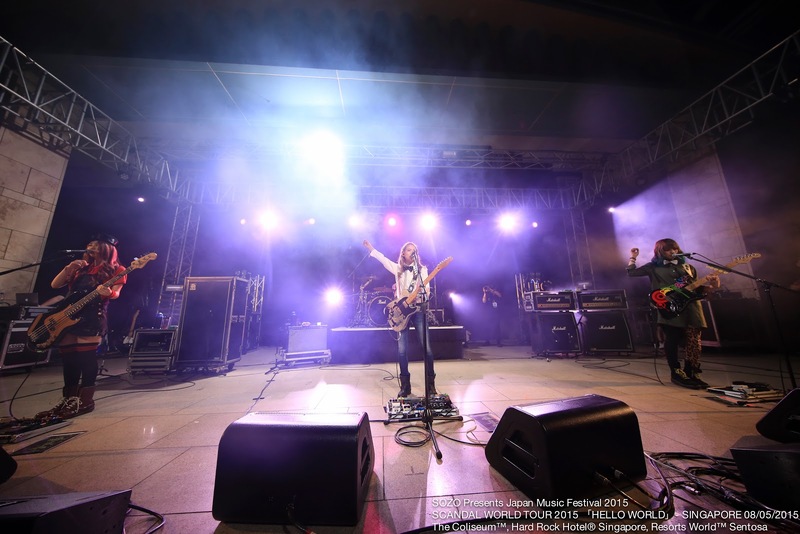 Of course, not forgetting herself, HARUNA then declared that they would be playing some songs from their latest album, HELLO WORLD! Thus, it then “re-”started with “Onegai Navigation” getting the ball rolling. At first I didn’t realize it, but these next few songs displayed their effort in making this concert an even more enjoyable one! As usual, the crowd was on fire, just going at it without a moment’s rest, and this continued with the next song, which was led by MAMI on vocals—“Hon wo yomu.” MAMI’s voice was sort of more refreshing and the audience really seemed to be enjoying this one as well! We then had TOMOMI leading the next song, “Can Beer.” In contrast, this song was sung in a really high-pitched-yet-cute manner. The audience was smitten! With the end of this song, the spotlights turned purple again, as if something special was about to happen. I didn’t know what to expect, but I could see RINA getting up from her drums. What could that possibly mean? I thought to myself. Somehow, the crowd had already gotten some idea by then. What’s your guess? RINA then returned to her drums and HARUNA said they would next be playing a song that was very important to each of them—“Departure.” Although this song wasn’t the type of tune that would get the crowd pumping, everyone still seemed to be really enjoying it, especially given its strong significance to the band members themselves. Next up was “Taiyo to kimi ga egaku STORY.” This song was nostalgic for many of us as it really brought back memories of the days when SCANDAL would often dress like schoolgirls! (But of course, I prefer their current, mature style more!) Following on from that was a more recent number—“Yoake no ryuseigun.” While this song was just pure joy, there was definitely more decent crowd interaction during the next song, “Your song!” Towards the end of the song, whenever the part played that goes “Woahhhh ohhh ohhh ohhh,” HARUNA would invite the crowd to sing along! Eventually it progressed to where only the fans themselves were leading that part, which was really heartwarming to see! Familiarity then struck through the crowd again as the next song played—“Image!” Compared to the other songs, the chorus of this song, I felt, was the most ecstatic one as everyone simply went wild! 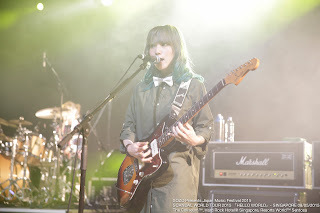 SCANDAL thanked everyone for being there that day and then left the stage around 21:34. Everyone was rather quiet about their departure at first, but in about a minute or two, they had already begun shouting for an encore! After about five long minutes of chanting from the crowd, SCANDAL finally made their entrance on stage again! HARUNA spoke about the thunderstorm that happened earlier in the day, as everyone who had been following them on social media knew that they had been caught in it for a few brief moments! With that as a cute segue, SCANDAL then played “Rainy!” The final song, which despite being last received one of the best crowd responses, was “EVERYBODY SAY YEAH!” Whenever the song reached the “EVERYBODY SAY YEAH!” part, the crowd would just fully jump around and sing along. It was just this utmost display of energy, despite us all having already been rocking nonstop since the start. By 21:45 the concert was now over. All four members moved towards the front of the stage, lined up side by side, and gave a 15-second-long bow to the audience to show their appreciation to them for attending the show. This was something worth praising for these girls! RINA then held up the Singaporean flag, swaying it around gracefully. Meanwhile, HARUNA held up a piece of paper that had handwritten messages for them from their fans! SCANDAL then slowly left the stage while waving goodbye to the crowd. However, this was not the final segment for VIP ticket holders, as they next had the chance to participate in a high-five session with the girls! It’s a simple gesture, but the fans enjoyed it very much. The concert had come to a close and overall, I truly felt that I enjoyed the gig they had presented! In hindsight, although I had been expecting some of their other songs to also get some stage time up there, the songs they did play were just as good! Lastly, I definitely recommend that people give them a listen or even attend their concerts maybe, as this is one band that is simply too good to pass up! 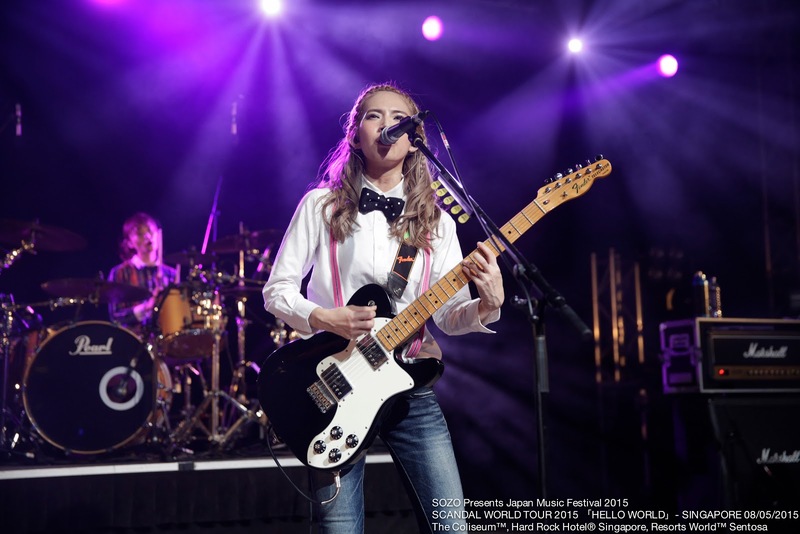 Have any of our readers attended SCANDAL’s HELLO WORLD tour so far? Feel free to leave a comment below on your experiences! In any case, thank you for reading my live report. Any feedback appreciated! Singapore awaits their return again! Special thanks to SOZO for providing us with this opportunity!